Emma and her horse, Robin, are getting ready for the big show. Put Emma in the saddle and practice jumping! Then groom Robin with brushes, combs and accessories to make sure that he will shine like a star. Load him into Emmas Horse Trailer and drive to the competition with the truck. With Emmas help and lots of practice, Robin is sure to win the top prize! Includes Emma mini-doll figure…. LEGO Friend Emma and her horse, Robin, are getting ready for the big show. Put Emma in the saddle and practise jumping! Then groom Robin with brushes, combs and accessories to make sure that he’ll shine like a star. Load him into the horse trailer and drive to the competition with the truck. With Emmas help and lots of practice, Robin is sure to win the top prize! LEGO model number: 3186: Includes Emma mini-doll figure; Features truck with horse trailer, staging area and practice jump. Animals include Emma’s white horse Robin. Accessories include saddle, bridle, apple, carrot and an animal accessory set with brushes, comb, bows, hairspray, soap and prize ribbons. Load Robin into horse trailer and get to the show! Size H19.1, W35.4, D7cm; Weight 420g; For ages 5 years and over; EAN: 5702014733176. WARNING(S): Not suitable for children under 3 years old. 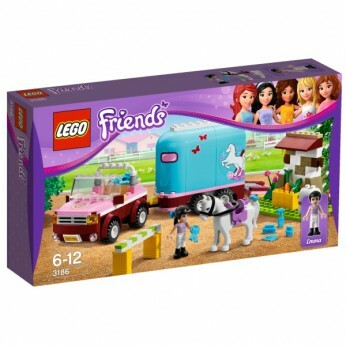 This toy costs approximately £13.29 (for the latest and best prices make sure you check our retailer list for the LEGO Friends Emmas Horse Trailer 3186 above). In our review of LEGO Friends Emmas Horse Trailer 3186 we classed it as being suitable for ages 5 years, 6 years, 7 years, 8 years but recommend you check the manufacturer specific advice before purchasing.